You can save a lot of money and time if you will work on your own auto repair. You will also get the knowledge how inner parts are working together. But if you want to do any creative and valuable work, you will require the best mechanics tool set that ensures repairs and maintenance go smoothly without any hassle. To buy the best mechanics tool set is a quite hard and challenging job as you will have unlimited choices in today’s competition. If you will buy socket and wrench sets one after one, eventually you will find yourself with no proper tools that help you in your job, so it could be better if you will go for entire sets or kits that offers practically all the crucial tools possible. ​To have the best mechanics tool set is very important especially for those who love repairing on their motorcycles, cars or other vehicles. It doesn’t matter about the level of your skill, you must need best mechanics tool set that meet your all the needs. Biggest factors while choosing the best kits are it has to be reliable in brand and durable in quality. Mechanics tool set ranging from complex tools to simple ones, from higher rate to cheaper ones. But you should consider the long term benefits of such tool set. Making your work easy, following we have prepared the list of top 6 mechanics tool set, we have also considered its features along with its pros and cons so you can get idea which could be the best tool set according to your requirement and budget. Crescent CTK170CMP2 is improved and well designed screwdrivers and blow mold case that is sturdy enough to keep tools safely. Case is engineered so well that now no need to worry about damaging or misplacing of the tools which always happen when we are working with the bits and pieces. Entire range of set it created according to ASME and ANSI standards. It is heat treated and oxidation resistant that lasts them for a long time. The wrenches, sockets and ratchets are finished with chrome and shaped perfectly balanced handles so you can hold it very comfortably while working. 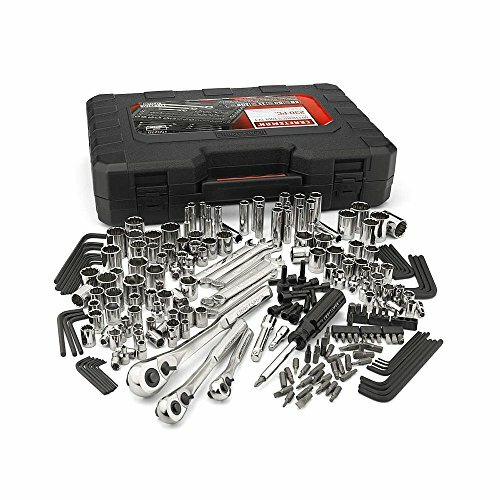 This tool set contains – Quick release ratchets in different sizes, sockets in various sizes, spark plug sockets, combination wrenches in many sizes, adjustable wrench, bit driver, extension, adapters, deep sockets, long nose pliers, screwdrivers, hex keys and a storage case. This tool kit is very useable for the professional mechanics who are working in an industrial environment and for those also who just want to be prepared when any need may arise. Each tool is made with the quality and proven to be safe as there is no any sharp edge in any tool. However, it will be the user’s responsibility to take care themselves while working with the tools. There are many people who are fond of Do It Yourself at home; they can take benefit from this tool set as it includes basic tools to the complicated ones. Tool set case is designed so well that it has its own area inside the case which will be very easy for you to store individual tool. It is always frustrating when you are working with the tools that you don’t get any particular thing when needed. The reason is that your tools are not well organized. Stanley STMT71654 can be the solution for this issue. If you are expert mechanic or you are from those people who just like to DIY to try to get it fixed. This product is the right tool set for you. Stanley is very well known for their quality products. STMT71654 includes ratchets, wrenches and sockets. This tool is made within the Society of Automotive Engineers’ standards. All the sockets are calibrated with the metric sizes so it will be easy for you to get the right size of the tool when you need it. Each tool is made with high quality of steel and finished with polished nickel or black chrome. 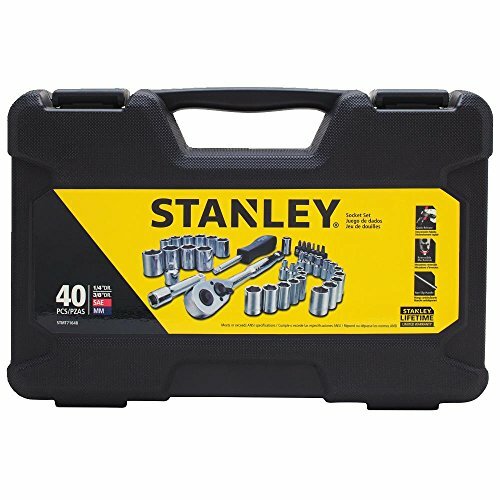 Stanley tool kit is very easy to use as it is designed with quick release ratchets and reverse switch is thumbed operated. Its sockets and extensions are deep and regular so it will not be removed easily and it remains in place until you remove it from the drive. It is made with metal material and contains 201 pieces of tools that meet your all type of need. Capri is one of the big brands in the tool industry and they have 30+ years of experience in the manufacturing high quality tools. Their all tools’ performance are excellent and you will feel proud the way your tool look and work. Capri is the nice set of locking pliers. It is contains 7 pliers that include 3 curved jaw, 2 long nose and 2 clamp pliers. This all comes in a memory foam type mat case which keeps all these tools well organized. It has many features which would attract you to buy such as it is designed with heavy duty Chrome Molybdenum steel material jaws and teeth which are tougher and grip objects from any angle, Curved jaw and long nose pliers have convenient built-in wire cutters. Beautifully designed with classic trigger lock that releases securely locks the pliers in place while you are working with tool; it has adjustable fit varying widths for your convenience. Pliers set is finished with corrosion resistant premium nickel plated finish. Mechanic’s tray is well designed that all the pliers are form fitted perfectly and the entire case can be fitted in most cabinets or tool chests. 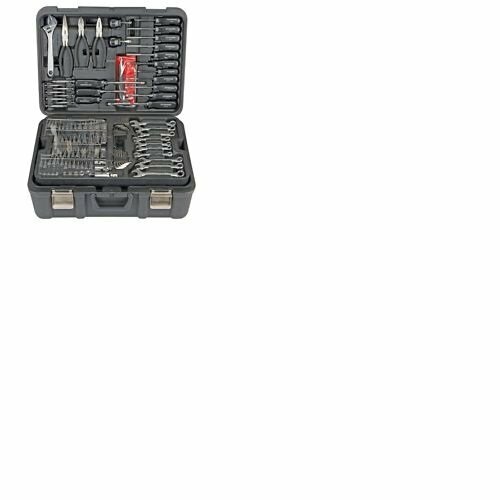 The Craftsman 50230 can be useful in wide range, this tool set providing you almost everything that you require for your construction work or repairing. It is very well engineered with extra flexibility and durability. It allows you to take them even for tough jobs. It has huge collection of ratchets, sockets, joints and extension bars so that you can do any kind of task easily whether it is simple or complicated. This set features a lifetime warranty and it is applicable for all the tools except the screwdriver bits. Thus, manufacturer ensures that their products are durable and you do not have to replace them for long time. If you will overlook such points, it has lot of other things which you can focus on. It comes with 230 pieces of mechanic tool set. Attachments include the 1/2, 1/4 and 3/8 inch drives quick release ratchets and 116 numbers of sockets that comes in metric and standard measurement sin 6 and 12 points. It is engineered with Allow Aluminum Steel with silver finishing that ensures durability for long time period. Ergonomic Magnetic Handle comes with 12 nut drivers which are available in standard and metric measurements, 40 screwdriver bits allows for powerful handling and solid grip. Comes with beautiful carrying case that protects the attachments and bits from damage and it is very easy to carry from one location to another. DeWALT has many years of experience in manufacturing industrial tools. DeWALT is well known for its high quality products since 1924. DeWALT DWMT72165 comes with tough and durable that made to last. It's provides users with a wide selection of tools to help complete most tasks. The set comes in a durable blow mold case featuring metal latches for added security. The 72 tooth count ratchet comes equipped with a quick release button to easily attach or remove a socket. It has Directional lever with low profile that reduces catch points and cane be operated with one-hand. If you will look at its other numerous features, you would probably go to buy this tool set. It is designed with deep laser etched markings for easy socket size identification. Handle bar has knurled beauty rings that provide a non – slip gripping surface, 72 tooth gear system provides high torque ratcheting. It comes with limited life time warranty. This tool is brought to you by Pittsburgh and they have wide experience of making tools since 1984. Pittsburgh lined to supply better quality tools and accessories to their customers in the areas of construction, shop, automotive and home use. 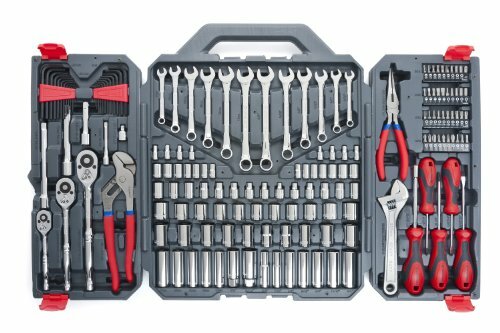 Professional 301 toll kit piece Mechanic’s Tool Kit includes a complete collection of the most used mechanic’s and automotive tools, including adjustable wrenches, sockets in SAE and metric measurements and pliers. It is very well designed with durable chrome vanadium. This tool kit is built to last and comes with a custom storage case with blow molded that keep tools very well protected and organized. It comes with SAE, Matric, Square, Star, and Spark plug sockets that meet your every need. There are so many other benefits having this tool kit as it has so many tools that every mechanic is look for. It contains ratchet set and chrome vanadium steel with polished finishing. Size or drive ratchets are 1/ inch, 3/8 inch, and 1/2 inches drive ratchets. Apart from those, it comes with 202 nos. of sockets, 5 nos. of extension bars, a breaker bar adapters, universal joints, 10 nos. of raised panel, 1 no. of adjustable wrench, 3 nos. of chrome pliers, 16 nos. of chrome screwdrivers, 8 nos. of precision screwdrivers, 42 nos. of carbon steel made hex keys, storage case in blow molded. If you are serious to add the best mechanics tool set that meets your every need, it is very crucial to know about it completely before you go to invest money on it. ​It is very irritating and tiring if your tool will breaks while you are working with it and nobody even want it. Tools which are made with alloyed and steel materials are typically durable as it offers a high quality. You should also check their connector and handles which are built with high quality of material. Tools which fit perfectly in your hand with a proper grip and you don’t require giving pressure so hard while using it that adds function and durability to a tool. Since you are going to use it in the garage or shop, you should also check that it will not get impacted by cold or heat. ​Ratchet tooth play an important role throughout in your buying decision. Always remember that your tool needed less swings when there are more ratchet on its teeth. The best mechanics tool set must have such features that offer easy use for the users. It will give shorter back swing in tight spaces if the tool has smaller and more teeth. Accordingly, best tooth ratchet offers less inner resistance that require less capacity to loose unscrew bolt or other nuts in return stroke. ​Your mechanics tool set must be a versatile and it should allow you to handle any maintenance task or any types of auto repair. If your tool set is versatile and the one which fits in most of the auto parts, you will not waste your time in searching cabinets for particular one that you need while you are on repairing job. You should also think about the benefits and the use of connectors and replaceable extenders so reaching any spot can be easy for you. In the world of latest technology, engines are becoming more compact and sometimes it can be troublesome to reach in the deepest spot to get the right angle, so you should have a set of tools that give versatility in examine and repairing your vehicle’s engine. ​The case of the tools is evenly as essential as its parts. Use of the case is to store and arrange the small pieces. Additionally, it works as a protective box when it is idle and no longer in use. A well designed case will let you to carry the case conveniently and allow you to remove all the parts effortlessly. Today there are so many brands which give all these small tools in a plastic made case with secured lock. In tool set there are so many small parts are included such as snaps, hinges, pins, draw bolt latches and other so many small parts which is hard to find sometimes if the case is not well designed and the parts are not well organized. ​As we have mentioned earlier, to buy the best mechanics tool set can be your long term investment so you should buy the one which has viable warranty. You will definitely want to protect it from any types of damage, whether that is due to quality of construction or due to function of the tool. You should check the warranty of the tool set for a certain period of time. There are many brands of tool set provide warranty for the life time but ensure to register your items on their website after purchasing in order to establish your warranty rights. All in all, if you have gone through our entire best mechanics tool set buyer’s guide, you would be sure which types of mechanics tool set you are looking for and if you are still not sure, we have short listed 2 best mechanics tool sets so it can be easier to narrow your selection. 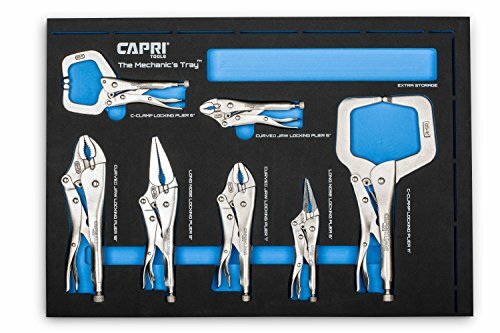 ​Capri Tools Klinge Locking Pliers Set can be the best choice since it is beautifully designed with classic trigger lock that releases securely locks the pliers in place while you are working with tool. It is made with heavy duty Chrome Molybdenum steel that ensures last longer life. It has so many things that you cannot resist buying this tool kit set. Other tool set which we have liked is DeWALT DWMT72165 204 Piece Mechanics Tool Set. 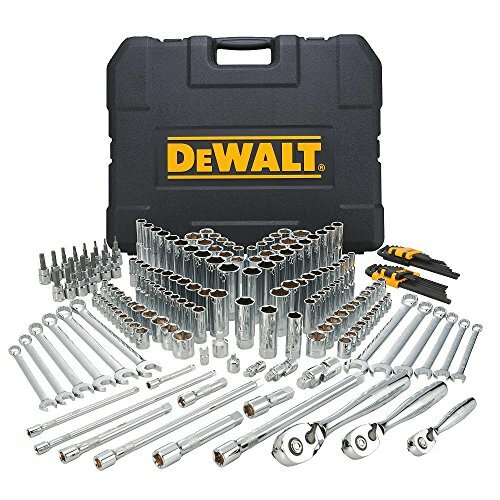 DeWALT name is very well known in the manufacturing of various industrial tool kits, and they have wide experience in making of the tools that meets every mechanic’s need. If you are new beginner or professional users and if you are planning to buy the new tool set or switch to the new model, after going through our entire buyer’s guide of the best mechanics tool set, you must be sure which model is the best and that meets your need.